All students should check in at the reception desk for appointments with any of these staff members. In addition, students who are using the Groves accommodations lab (for testing) and students who are serving as test proctors or notetakers through the CLASS office should also check in at the desk. 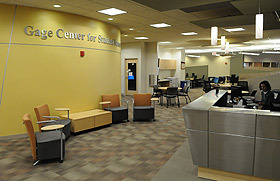 Reception desk hours are 8 a.m. – 5 p.m. Monday-Thursday and 8 a.m. – 4 p.m. Friday.